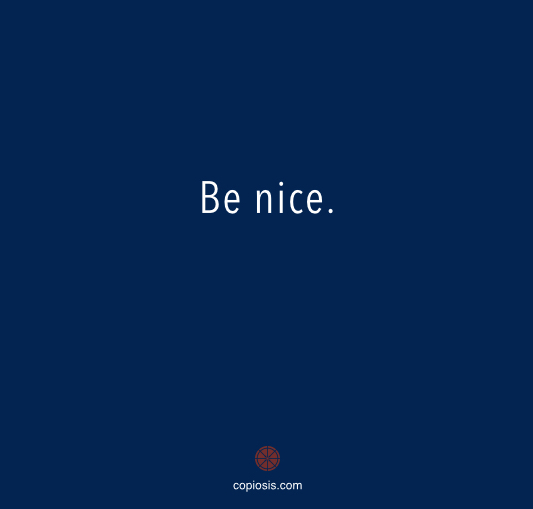 People sometimes wonder if being nice is necessary to obtain luxury products and services in Copiosis economies. They argue that in money-based economies, you don’t have to be friendly or polite to the person you’re buying from. You just need the cash. In Copiosis, producers can refuse to give you products and services if they don’t like you. Meeting the NBR gateway won’t be enough. This is true in money-based economies too, by the way. Producers and sellers don’t have to sell to you if they don’t like you. But since they need money to get their needs met, they will often suffer extreme abuse to get it. You can be a total jerk and still get what you want if you have the money. I don’t see anyone tolerating mean people in Copiosis. You can’t get another’s NBR even if you wanted it, so bending over backward to please the customer, no matter how much of a curmudgeon he is, is no longer necessary. Besides, you don’t need others’ NBR. You can easily accumulate your own and choose not to serve whomever you want. In most cases there will be more than one provider for given goods and services, just as in capitalism, so jerks can get their needs met from the mean producers. Nice people can enjoy interacting with other nice people. It helps if you’re nice in Copiosis just as it does in capitalism. More important than how nice you are is what you do for others. Are you doing things that help other people? Are you making life better for others? Are you helping to improve the carrying capacity of the planet? Are you improving the ecosystem by finding ways to use natural resources more efficiently/sustainably? Your ability to produce net benefit is a far more important criterion than is your niceness. If you’re seen as someone who generates a lot of good for people and the Earth, others are going to want to serve you and work with you, too. If you’re a jerk, I don’t think people will tolerate you when there are many other ways to accumulate NBR. In a system where we aren’t compelled to do anything, people will likely choose not to work with curmudgeons, be subjected to abuse at their hands, or be treated any other way than cordially. If you’re a mean or angry or bitter person and generally unpleasant to be around, you’ll likely still get your needs met. Of course, there are lots of opportunities for you to get relief from all that negativity if you choose, since mental health care is provided to all at no cost. And that’s one of many fringe benefits Copiosis offers humanity: total freedom. You can be a curmudgeon and not take advantage of the many opportunities a totally free, unfettered-by-cost civilization would offer. There will be a lot of well-trained, passionate people willing to help you become a better woman. Or man. Have you ever been forced to swallow your pride and take punishment at work, or in some other context because you needed the money? I’d enjoy hearing your story.